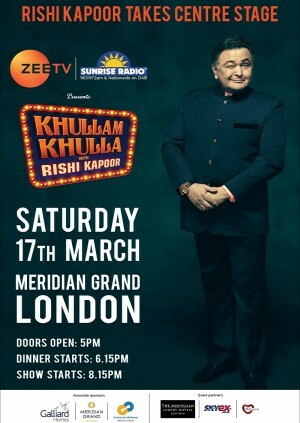 Zee TV and Sunrise Radio are proud to announce an experiential event with Bollywood legend Rishi Kapoor, called Khullam Khulla with Rishi Kapoor. Khullam Khulla is your ticket into the very heart of Bollywood and your tour guide is none other than Mr. Rishi Kapoor, also known as Chintu! Rishi Kapoor is one of the most outspoken and hilarious speakers. In this live show, you'll hear the true untold side of Bollywood, narrated by the ultimate insider - Chintu Saab. The authenticity of this show is the Man Himself! For over 2 hours, the legend will regale the audience with stories of his struggle, passion, inspiration, success and failure from the industry in trademark outspoken and hilarious style. The London show on the 17th of March will be a gala evening of extravagant entertainment with welcome drinks, a 3-course gala dinner, full table service, cabaret style seating and the company of the ultimate Bollywood insider – Chintu Sahab himself! Cabaret style seating with table of 10 for Gold ticket holders and a table of 12 for Silver ticket holders. Each table will include a 3-course lavish dinner, table service, welcome drinks.